In June 2017, representatives of the Broad Institute and MIT in front of the European Patent Office requested another extension of six months to answer the multiple oppositions to one of their granted patents EP2764103, due to the complexity of the case and links with other co-pending patent oppositions such as EP2771468. The latter will be examined in oral proceedings mid January 2018 – keep this milestone in mind whenever assessing the European CRISPR patent battle status! A few weeks ago, the Doudna-Charpentier patent also received its grant notification in China. 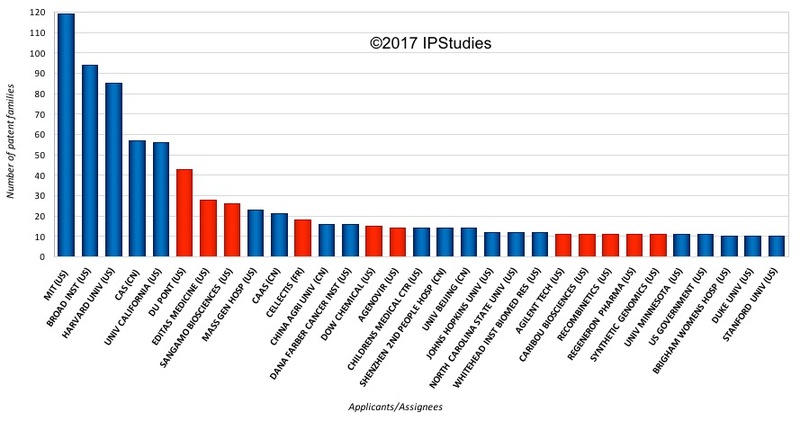 China confirms its significant patenting activity in our latest statistics, yet a number of those patent applications have not been extended internationally; we observe that the patent landscape in China is thus quite specific, compared to its European and US counterparts. We are currently compiling statistics on granted CRISPR patents specifically, as this set is fast growing too. Stay tuned!